of the world's 42 million people displaced by war and violence. What if there really was such a thing as a peace machine? One of our members described our project as “a legacy leaving machine”. Others have called it the world’s largest virtual peace movement and even World Peace 2.0. However you choose to think about us we believe in creating world peace through personal empowerment. That means empowering your life, and the lives of your loved ones on a very personal level as well as giving you the power to design the very future you want for yourself and for those you will leave behind. Founders Julian Kalmar and Rick Beneteau had the crazy idea that they could do what no politician or world leader has ever been able to do -- create a real path to world peace. They decided that with one-fifth of the world's inhabitants connected together by the Internet, and their knowledge of Internet marketing, coupled with their mutually strong desire to do good in the world, they would create a 21st century solution that creates the preconditions for world peace while healing the damage done to victims of war and violence all over the world. You can read their biographies at the end of this document. You can actually measure the good you're doing to create global peace with simple 5-minute actions that multiply on their own as you go on with your life. The mission of 10 Million Clicks For Peace is to create world peace through personal empowerment by providing tools that allow anyone with an Internet connection to help fix global problems. Every life we touch will be made better by the peace education materials we provide, for free, while providing shelter, food, medicine and much needed hope for the 42 million people displaced by violence. We give financial support to humanitarian organizations like Mercy Corps, Women for Women International, Refugee International and International Rescue Committee, and, for peace education organizations such as the M.K. Gandhi Institute for Non-Violence, Happiness Clubs and the Prison Books Program. "Peace in its most fundamental form is the connection of one human spirit to another. 10 Million Clicks For Peace hastens the connection process. What a beautiful and remarkable concept!" "10 Million Clicks For Peace has the distinct ability to...lighten the burden of peacemakers everywhere." "10 Million Clicks For Peace is a beautiful expression of our infinite creative potential. We are free to create peace for ourselves...and now it's as easy as a few clicks. What a magnificent project!" "Thankfully, most of us have never witnessed firsthand the brutal horrors of war and genocide. For those of us who have (and I am one), 10 Million Clicks For Peace offers great hope for the prospect of true and lasting peace in the world. I whole-heartedly support this noble work!" "Led By Faith: Rising from the Ashes of the Rwandan Genocide"
"Once in a great while, a project comes along with the most profound implications for the future of all humanity. For the first time in history, every person can effortlessly contribute to world peace using the power of the Internet. 10 Million Clicks For Peace is a mission of the highest human spirit and contains a most remarkable mechanism for creating world peace. I am honored to give this innovative humanitarian project my full support that we may once and for all move all peoples and all nations towards greater kindness, harmony, and love." "This reminds me of the saying that it's better to light one candle than to curse the darkness. 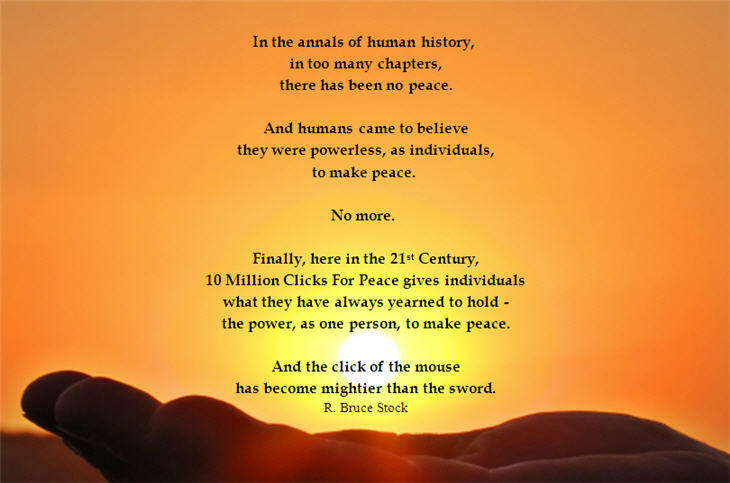 Imagine the effect of 10 million clicks for peace -- each click symbolizing a peace candle!!! Let us join together in one great moment of dedication, in one special moment of caring to make 10 million clicks for peace and to light 10 million candles in our hearts. A noble cause, indeed!" "When You Can Walk on Water, Take the Boat"
His previous experience includes 5 years at NASA's Jet Propulsion Laboratory, working in radiation-effects testing of semiconductor devices, and building one of the world's first large parallel-computers. He spent 9 years working in electronics, 13 years in software development, and 2 years repairing industrial machines (some as big as a house). After the first year in bed, he received a letter from an unhappy friend. He began his reply with hopes of imparting what he knew about happiness—in spite of difficulties. Thirty-five pages later, he realized he had a serious problem…much more to say and not enough paper. It was then he realized that writing a book could help many find greater happiness. That book opened the door to a remarkable spiritual transformation that reconnected him to the teachings from his early life with his grandparents. They showed him how to be live happily regardless of circumstances, but they had done something far greater. While taking a break from writing his book, Julian became profoundly moved by a documentary on the plight of Afghanistan's 1 million war refugees. During the program, he found himself looking straight into the eyes of a family who could have been his own grandparents 60 years earlier. In that moment, decades vanished, and he "connected." He knew immediately that part of the proceeds of his book would go to help war refugees, yet it would take 4 years before he would finally come to know the sheer scope of the project he would come to lead. 10 Million Clicks For Peace is Julian's path to repaying—with compound interest—the anonymous gifts of kindness bestowed on his grandparents, kindnesses that allowed them to survive their experience as war refugees. Those kindnesses are responsible for Julian's very existence. Julian takes no credit for 10 Million Clicks For Peace. He believes the project was inspired. He is just an instrument of the Universe…doing what the Universe is best at: Connecting. Professional Song-writing. Throughout the 1970's and 80's, while "firing up the dry-cleaning boilers" at 5 am, six days a week, Rick pursued his musical passion; writing, recording, and pitching songs. He won Billboard Magazine's International Songwriting Competition the first two years running, and other major music competitions. Internet Entrepreneur. Devastated, and unwilling to lead the starving artist lifestyle, Rick made his way to the Internet and began using his entrepreneurial and creative skills to become one of the original Internet marketers. He was the first person to write about joint-venturing as a means of Internet marketing, and many of the biggest Internet marketers in the world, owe their start to Rick's pioneering work. He went on to create top-selling marketing products, like: Ezine Marketing Machine, Branding You, and Breaking the Bank, and he originated the Internet's first two-tier affiliate program with his traveling billboards, I.D. IT! Plates. Philanthropy. In 2001, Rick founded the Internet's first toy drive, an online holiday mainstay for eight years. 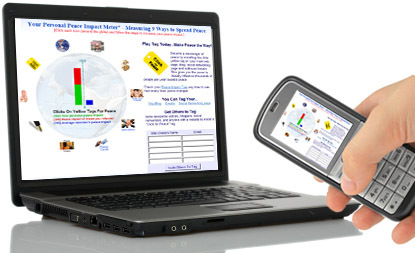 Recruiting the top Internet marketers in large promotional campaigns aimed at making sure no child is left without at least one gift under the Christmas tree, InternetToyDrive.org is a corporate sponsor in direct affiliation with the official "Toys for Tots" program. Entrepreneurial 9/11 Transition. The tragic events of September 11, 2001 affected Rick so profoundly that he decided to change direction from helping people build online businesses to simply helping build people. His breakthrough ebook from 2002, Success: A Spiritual Matter, the first in a series of products that bridge business success and spirituality, remains an entrepreneur's favorite to this day. In 2003, Rick's first print book, A Large Slice of Life to Go, Please! was published, landing him the prestigious Pinnacle Book Achievement Award and many high-level endorsements. The first email was a CNN Breaking News Alert outlining the latest gory details about the bloodbath in the Middle East. It literally made him nauseous. The second was from Julian Kalmar, a man Rick hardly knew. Julian explained that he couldn't sleep that night, fearing for the lives of two friends, one in Lebanon, and one in Israel, friends he could no longer reach and whom he feared had been killed. He wrote that he had asked the Universe what he could possibly do to help, and immediately, "10 Million Votes for Peace" jumped into his mind. That was Rick's cue to call Julian. At 6:42 a.m. they began discussing the project that became known as 10 Million Clicks for Peace. Two years later, Rick is as enthusiastic as ever that the work he's doing will change the world. The Peace Impact Meter (i.e. Peace Machine) technology he developed with Julian Kalmar opens the doors of philanthropy wide to the waves of regular folks who want to help, but don't know what to do. "Now they know exactly what to do and can see measurable results right on their computers and cell phones. We'll empower millions to create world peace for their children, their grandchildren, and themselves, and I believe we'll reach the tipping point for peace.. This is the legacy I want to leave, and this work is how I'm spending the rest of my life."